Hywind Scotland, the first floating wind farm in the world, has started to deliver electricity to the Scottish grid. On October, 18 the First Minister of Scotland, Nicola Sturgeon, officially opened the wind farm. The 30 MW wind farm, operated by Statoil in partnership with Masdar, is located 25 km offshore Peterhead in Aberdeenshire, Scotland and will power approximately 20,000 households. “Hywind can be used for water depths up to 800 metres, thus opening up areas that so far have been inaccessible for offshore wind. The learnings from Hywind Scotland will pave the way for new global market opportunities for floating offshore wind energy. Through their government's support to develop the Hywind Scotland project, the UK and Scotland are now at the forefront of the development of this exciting new technology. 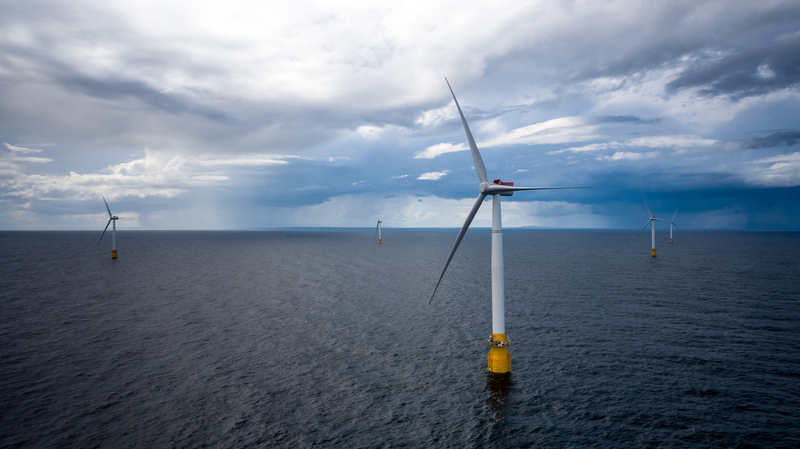 Statoil looks forward to exploring the next steps for floating offshore wind,” says Irene Rummelhoff, Executive Vice President of the New Energy Solutions business area in Statoil. “This marks an exciting development for renewable energy in Scotland. Our support for floating offshore wind is testament to this government’s commitment to the development of this technology and, coupled with Statoil’s Battery Storage Project, Batwind, puts us at the forefront of this global race and positions Scotland as a world centre for energy innovation,” said the Scottish First Minister Nicola Sturgeon during the opening ceremony. The onshore operations and maintenance base for Hywind Scotland is located in Peterhead, while the operations center is located in Great Yarmouth. Linked to the Hywind Scotland project, Statoil and partner Masdar will also install Batwind, a 1 MWh Lithium battery storage solution for offshore wind energy. “Statoil has an ambition to reduce the costs of energy from the Hywind floating wind farm to € 40-60 €/MWh by 2030. Knowing that up to 80 % of the offshore wind resources are in deep waters (+60 m) where traditional bottom fixed installations are not suitable, floating offshore wind is expected to play a significant role in the growth of offshore wind going forward,” says Rummelhoff. Hywind Scotland is adding to Statoil’s strong UK presence, and already has a sizeable renewables portfolio with an offshore wind portfolio with the capacity of providing over 1 million homes with renewable energy. Statoil operates the Sheringham Shoal wind farm in the UK, which has been in production since 2012. The Dudgeon offshore wind farm in the UK, also operated by Statoil has now been completed and is also in production. In 2016 Statoil also acquired 50% of the Arkona offshore wind farm in Germany, which will deliver power in 2019. Statoil recently announced the acquisition of a 40% share in the construction ready 162MW Apodi solar asset in Brazil.